A Rich Tradition......of pure unadulterated Greed! The Ferengi suffer from some serious flaws. I'm not referring to their capitalistic culture, the greed, the untrustworthiness, etc. I'm referring to their gameplay flaws. The low attributes, the pervasiveness of treachery, and the low range ships. There's probably more I'm forgetting. So what are we going to do about it? How can a person build a competitive tournament level, single headquarter deck for the little orange trolls that doesnt rely on cheap tricks like Dabo? We need to use a solid proven strategy...a *traditional* strategy. Enter Ferengi Tradition. You pay ten points and you get twenty in return. The math becomes simple. Once you have 80 points you can play two copies of this event and you win the game. Let's simplify the idea. Once I have ten points I can get to 30 and then all I have to do is score one planet and one space for the additional 70 I need to win. Two 35 point missions shouldnt be hard. There are lots of choices that are actually somewhat easy to complete even for team orange. Survey New World, Runabout Search and Track Survivors seem like the best choices. The first two of the three in particular. In space we have Kressari Rendezvous with an equipment and the new Ferengi Mission in this set - Falsify Distress Signal. I choose them because they each have a span of two which gives us further reason to add non-aligned personnel to the deck and go with non-aligned ships with eight range on them. Speed has historically been the key to winning. I'm not going to flesh out the rest of the deck though. I will leave that to all you eager beavers out there. I'm sure there will be a few variations on this deck. Different ideas on which skills to focus on, which missions to use and so forth. I've built enough decks with everyone over the years now and I dont feel the need to do so on this one. 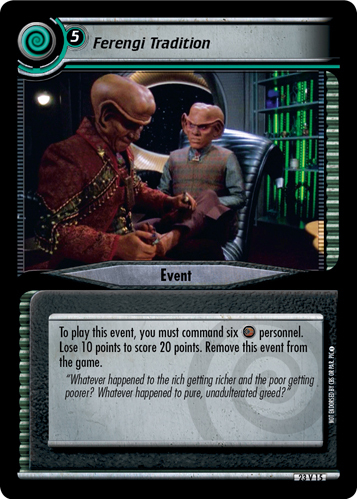 One of the reasons is that this is the first ferengi deck idea to come along in awhile that doesnt seem to have a necessarily focused or pre-planned trick you have to perform. You can score those ten points early with Tongo:Confront, or score them late with the Enterprise-D or score them in spurts with Grand Nagus Brunt and Daimon Solok. You could use them to fuel At What Cost? for more speed and then Tongo to make the points up later. I pointed out those missions because they seem like the best candidates but are not necessarily the only choices. Mission selection though tends to be the least customizable aspect within a deck archetype. The key to the new ferengi two mission win archetype will be the personnel selection and the choices players make with which cheaters to use. It will be interesting to see if anyone takes up the challenge of this new deck type and what they do with it. If you happen to be one those people who takes up the challenge then good for you and remember your Rules of Acquisition.